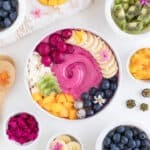 This tropical pitaya smoothie bowl is an easy and healthy breakfast recipe. The delicious flavors of mango, lime, banana, and pitaya will have you craving more! Combine all ingredients into a high-speed blender or food processor. Blend until smooth. Spoon the smoothie into a bowl. Add fresh fruit, nut butter, granola, or any of your favorite toppings. Make sure to use frozen fruit for a smooth and creamy consistency.